Habit: Perennial herb, subshrub, 2--6(8) dm from much-branched caudex. Stem: generally branched proximally, with long, nonglandular hairs and shorter, stalked glands. Leaf: 2.5--10 cm, reduced distally on stem, linear to lanceolate, oblanceolate or elliptic, acute to spine-tipped, +- spiny-dentate, generally soft-hairy and glandular. Inflorescence: peduncle 8--25 cm; phyllaries 5--25 mm, 0.7--2.5 mm wide, soft-hairy, glandular, innermost < to > immediately preceding series. Ray Flower: 25--60; tube 4--6 mm; ray 1--3.3 cm, lavender, light blue, or white. Disk Flower: 70--110; corolla 5.5--8.5 mm. Fruit: 3--6 mm; pappus bristles <= 9 mm. Chromosomes: 2n=12,24. Unabridged Note: A 2nd variety in Arizona, Nevada, Utah. 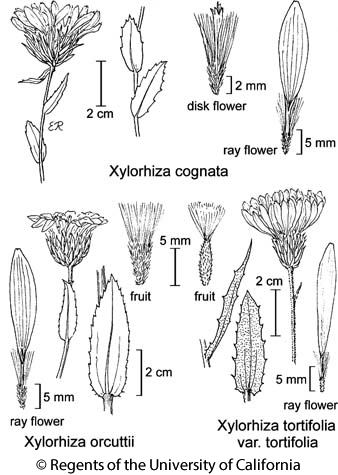 Citation for this treatment: David J. Keil 2012, Xylorhiza tortifolia var. tortifolia, in Jepson Flora Project (eds.) Jepson eFlora, http://ucjeps.berkeley.edu/eflora/eflora_display.php?tid=8604, accessed on April 19, 2019.